Saw this today at Harbour Lights Southampton on a members' free preview. Thank you Picture Houses! A gift in more than one sense. This is another film in the growing list of titles which are about and for the silver haired brigade. Others would do well to watch and learn. The premise is simple. 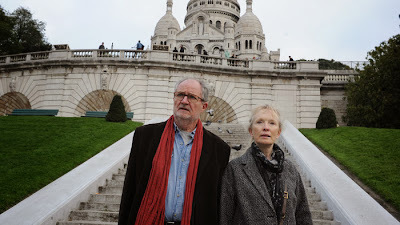 Nick (Jim Broadbent) and Meg (Lindsay Duncan) are recent empty nesters who travel to Paris on their 30th wedding anniversary to rekindle their mojo. What the film really does, is hold up a mirror and invite the viewer to conduct a long hard examination of where they are in life, what their priorities are and what their aspirations are - all within the context of a moribund marriage. Meaning-of-life stuff. As sixty-somethings facing a late mid-life crisis, Nick and Meg bicker and fight their way through the weekend. If this film wasn't liberally peppered with humour, it would be too heavy, disturbing and sapping of emotional energy to bear watching! Both the main characters are contemplating a change of direction but both are haunted by their insecurities which translate into an inability to talk about the real issues and so each shadow boxes - but even the shadows are phantoms. The way in which the story unfolds exquisitely depicts the emotional frailty that can hold a relationship together - more like being held together by the gaps in the structure rather than the structure itself. This is undoubtedly aided by the first class acting of Broadbent and the lovely Duncan. I found neither Nick nor Meg to be likeable characters. It takes a chance encounter with old friend, Morgan (Jeff Goldblum) for the dynamics of the weekend to change and begin heading in a different direction. An invitation to a supper party celebrating the success of Morgan's latest book provides the conversations that become the catalyst offering the possibility of change. The whole film is beautifully set in Paris and the screenplay delivers a number of memorably stunning lines - mainly from Nick. I felt I could relate and identify with the struggles Nick was facing very easily, but I found that connecting with Meg was much more difficult. I wonder if that is a Martian/Venusain distinction, a gender thing? I must take my significant other along and see what she makes of it. As I said, younger people in relationships would do well to see this and contemplate how it might help them avoid angst and regret later in life. It would make a good subject for a relationship study and group discussion. For everyone it offers a generous and benevolent opportunity to carry out an 'examine' on your own relationships. Hopefully with encouraging results! I'm going to give this gift of a film 8.5/10.